I wanted to take a minute this morning to let you know about a fantastic new website specifically for readers. It's called The Book Locker. Basically, around 8 titles are chosen weekly to be featured in every genre, and readers can download them for FREE. How cool is that? You just browse through the genre lists, choose the book you want, check your email and start reading. How cool is that? The titles are available for free through InstaFreebie (another great website for readers, I might add). Anyway, I just thought it might be something you'd like to know about. As for what I'm up to, I am SO close to being done with the next book in my series, Fate Surrendered. I hope to have it published by April. I am so pleased with the feedback I have gotten from the first book, Fate Abandoned. It can be really nerve-wracking to put your book out there and have no idea what the response will be. As much as I wish every reader will love what I write, not everyone loves every book. But it makes me very happy to see that, so far, readers are really enjoying it. And I am confident the next book is even better. It will be well worth the wait! Happy Friday! Hope everyone has a great weekend. Now… on to the freebies! I've teamed up with a bunch of fellow authors to share even more free books with you. There are books from just about every genre you can think of, so take a look. I'm sure you'll find something that interests you! Just click on the image or text beneath the image to access the promo website. Even if you're already reading something now, go ahead and download a book if it catches your attention. It may only be available to read for free for a limited time. There are plenty of great romance novels in this list – everything from hot and steamy to nice and sweet. Lose Yourself in FREE Books! There are books in every genre, from fantasy to romance, thriller to science fiction, historical fiction to action/adventure, and women's literature to cozy mystery. ALL FOR FREE from February 8th-15th! I really hope you find something that you enjoy. I've browsed through the lists myself and have my eyes on a few books already! Have a great day and an even better weekend! I hope everyone is having a fantastic Saturday! Mine is off to a great start. I have both of my books on sale for $0.99 this weekend, and I'm very happy with my rankings right now. 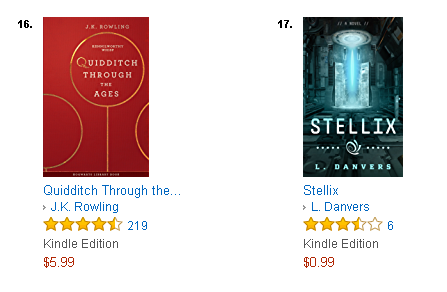 At the time of writing this, my book Stellix is right next to J.K. Rowling's Quidditch Through the Ages (http://amzn.to/2kE5nqy). Pretty cool, right?! I might have to frame that screenshot. Haha. Anyway, I appreciate the tremendous support! This made my day. In other news, I'm almost 20k words into my next novel, Fate Surrendered (Book 2 of the Fate Abandoned Series). I am having so much fun writing it. I'm going to be kind of sad when this series is over. I'm planning on making it three parts, so I still have one more to go once I finish with this one. As for what's next, I have a REALLY cool idea for a YA space fantasy. The idea came to me very clearly, and I hurried and typed some of it out while it was fresh. I think it's going to be a really fun story, and it has the potential to become a long-running series. Ahhh, so many books to write, so little time.